He moved to the stage with the strut and the swagger of joyful New Orleans. As the music soared and brightly-colored umbrellas danced above the heads of a group of teenagers, Ansel Augustine flashed a smile that was almost as bright as the bling on his fingers and the sparkling gold-white-and-black boots he wore. 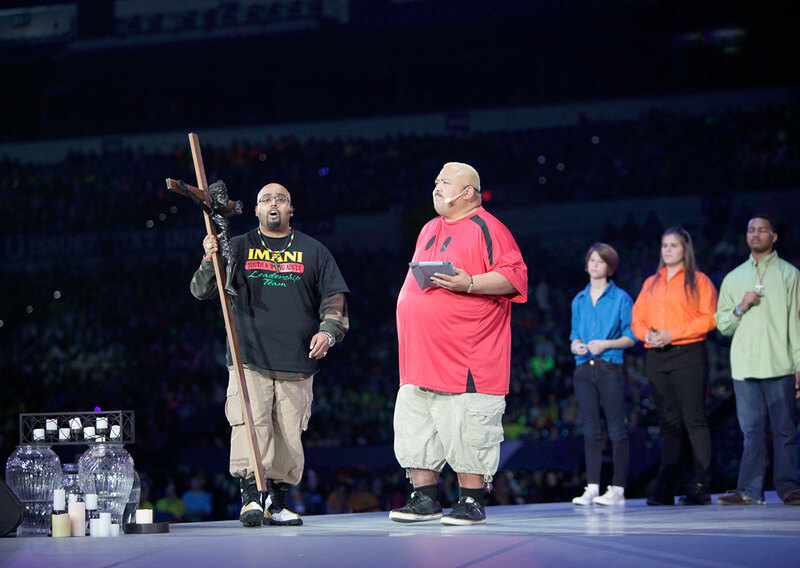 On stage, the celebration continued as the longtime youth minister led the youthful Psalm 119 Step Team from the Archdiocese of New Orleans in a rousing, stomping dance number that brought the 23,000 teenagers inside Lucas Oil Stadium to their feet, cheering. Yet even with all that strut and swagger, perhaps the most lasting impact that Augustine made on the participants of the National Catholic Youth Conference (NCYC) on the early morning of Nov. 23 came through the spirit and the substance of two stories he shared. Augustine’s first story focused on a group of men hustling through an airport after a business trip, trying to make a flight home that was ready to leave. “They’re running through the airport and one of them accidentally knocks over this little girl’s fruit stand, fruit going everywhere,” began Augustine, director of the Office of Black Catholic Ministries in the Archdiocese of New Orleans. All but one of the men made the flight, Augustine noted. “He called his wife and said he’d be late. He went back and saw this young girl hopelessly on the floor, groping for fruit, people ignoring her, and no one there to care for her. The man spent the next several minutes putting the fruit stand back together for the girl. By this time, he had to leave to book another flight. As the once rocking stadium turned silent, Augustine paused before asking the Catholic youths a question. “NCYC, young Church of today, are you Jesus? Can people mistake your life so much so as that of one of Christ? The way you treat one another, how you act, can people say, ‘That’s a follower of Christ’? Or do you just go with the flow? Are you scared to step up and speak out in the name of Jesus? Augustine’s second story focused on a father and a daughter. One of their common bonds was fishing together, and they were just heading home from a day when they had caught a bounty of fish. As they headed back to the pier in a row boat, the daughter told her dad, “I bet I can beat you to the pier if I swim.” The dad let her. “She jumped in the water and started swimming as hard as she could,” Augustine told the teenagers. “Trying to make his daughter feel good, the father started rowing real, real slow. As the daughter started swimming harder, he started noticing ripples in the water behind her. He started rowing a little faster. All of a sudden, an alligator’s head popped out of the water. In the frantic seconds that followed, the father made it to the pier while his daughter was just feet away from reaching it. The dad told the daughter to jump to him. At the same time, a farmer was driving by, saw the struggle, grabbed his shotgun and fired at the alligator, killing it. Augustine continued the story by focusing on a moment a few years later when a reporter came to visit the girl in the hospital—as part of a “where are they now” story. By then, the girl had reached the point where she was walking again. Augustine let the emotion of those words sink in for the teenagers.